Andrew Leigh has won the 2018 Bragg UNSW Press Prize for Science Writing for ‘From bloodletting to placebo surgery’, an excerpt from his book Randomistas: How Radical Researchers Changed Our World (Black Inc.). 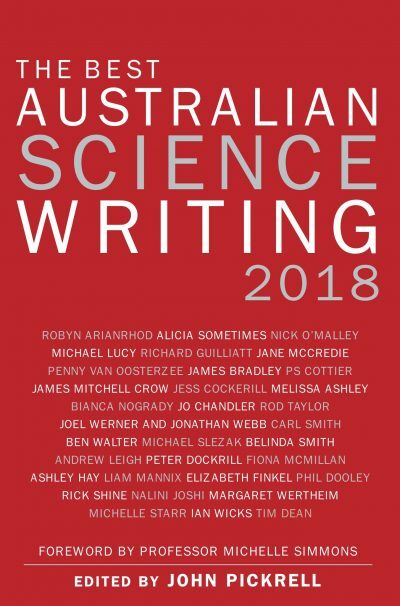 Leigh’s piece will be published in the anthology The Best Australian Science Writing 2018 (ed by John Pickrell, NewSouth), along with the five other shortlisted pieces, and he receives a $7000 cash prize. Runners-up prizes of $1500 were also awarded to Jo Chandler for ‘Amid fear and guns, polio finds a refuge’ (Undark) and Margaret Wertheim for ‘Radical dimensions’ (Aeon). Preethika Mathan from Sydney’s Santa Sabina College won the UNSW Bragg Student Prize for high school students in years 7-10 for her essay ‘I-Care’. Mathan’s essay will be published in Double Helix magazine and online. Named in honour of Australia’s first Nobel laureates, the Bragg UNSW Press Prize for Science Writing is presented by NewSouth Publishing for short nonfiction pieces of science writing that have been written for a general audience. For more information about the prize, visit the NewSouth Publishing website.